Pattaya is 147 kilometres southeast of Bangkok, and faces the Thai Gulf. Pattaya is Asia's premier beach resort, and caters with equal appeal to families, couples and single visitors. 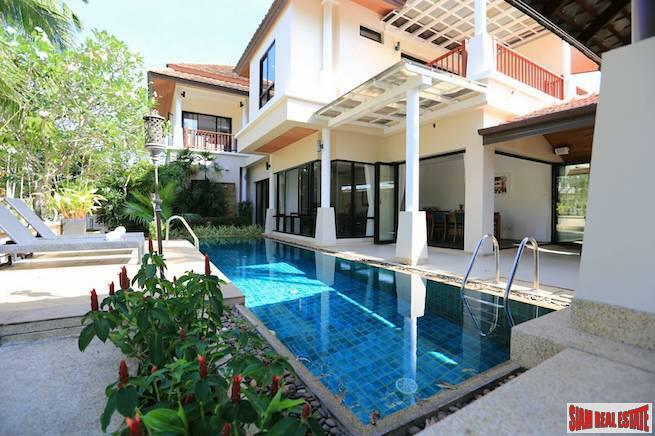 Pattaya's relaxing tropical ambient is synonymous with every ingredient for memorable holidays. 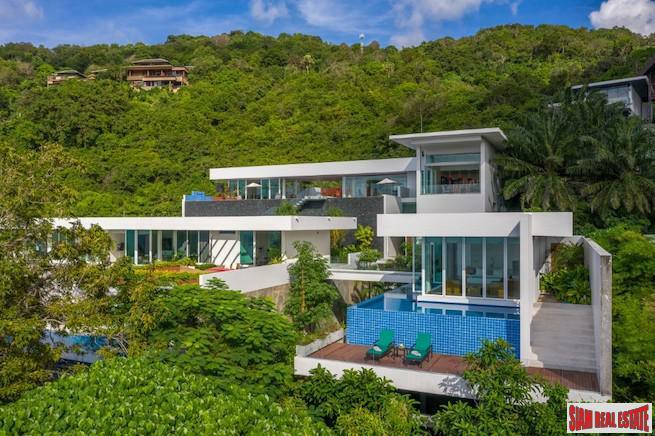 Within twenty years, Pattaya has been transformed from a sleepy fishing community into an international resort often referred to as the 'Thai Riviera'. Pattaya is literally a place where East meets West , both in colour and character, and is probably the most cosmopolitan place in Thailand after Bangkok. For sun lovers and water-sports fans, Pattaya's sunny climate provides ideal conditions for swimming and all other imaginable water activities, including fishing, boat sailing, speed-boating, water-scooter riding, water skiing, parasailing, scuba diving and windsurfing. For those who do not want to get drenched, Pattaya also has gyms and health clubs for exercise and many kinds of land sports and games to choose from, such as shooting, car racing, horse riding, archery, golf, bowling, tennis, go-kart, paintball, etc. For shoppers, fashionable boutiques and shops of ready-made garments, silk, paintings, handicrafts, gemstones, jewelry and trinkets are centered in the main street of Central and South Pattaya and also in the luxurious hotels. And the prices are fair. For gourmets, Pattaya's cookeries offer at reasonable prices a wide range of superlative fresh seafood and various styles of cuisine -- Thai, Chinese, Japanese, Korean, French, Italian, German, Scandinavian, Mexican, American, Indian, Russian, etc. And for night owls, Pattaya's lively nightlife caters for every taste. The most brightly colorful spot is South Pattaya where all kinds of nightly entertainment are offered. In short, Pattaya is the place for all. No wonder it has remained popular among those who come to spend their holidays from far and near alike. 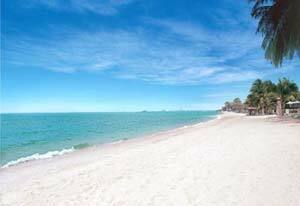 Some 4 kilometres long, this beach faces Pattaya Bay, the major venue from where boats visit Pattaya's offshore islands. The beach curves from north to south and is largely paralleled by a tree lined promenade and beach road which is lined, in the northern and central parts, by hotels and restaurants. The northern section of the beach is largely tranquil, while the central and southern parts become increasingly lively, thanks to a position of shops, department stores, boutiques, beauty salons, supermarkets, bars, discotheques, restaurants and nightclubs. 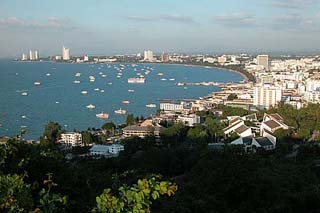 The central area of the beach is a major shopping area, while the southern end is one of Pattaya's major nightlife areas. 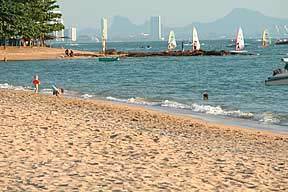 This 6-kilometre long, largely straight beach, some 4 kilometres south of Pattaya, is the most notable of several beaches south of the resort. The beach is popular with windsurfers and water sports enthusiasts, largely because the area enjoys brisk and fresh breezes sweeping island from the Thai Gulf, and because the seas are less congested with boats than is Pattaya Bay. 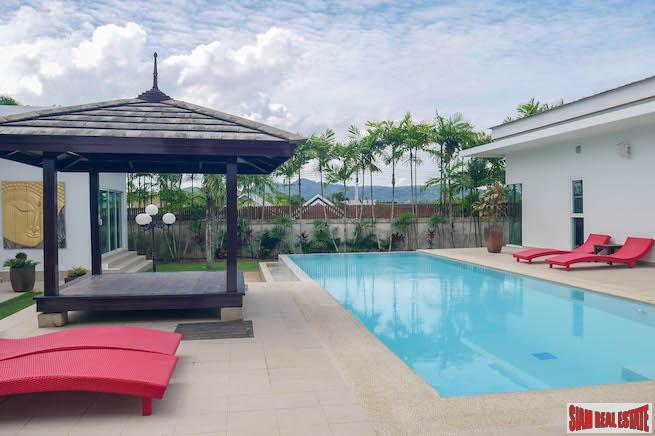 Jomtien is also a major residential area with beachside hotels, bungalow complexes, condominiums and restaurants.